The young American painters have always worked on the front lines of artistic development. Today’s need for a new visual language and the new aesthetic style pushes artists to think outside of the traditional painting and sculpture media and to investigate the world of technology for new tools and mediums for expression. Evident today, in the circle of the young American painters, is a growing need to investigate all the set definitions concerning the material and subject matters. We witness a revival of abstract art, and a new movement coined Zombie Formalism, along with the focus of many artists concerning issues of identity. The need to find one’s space in the world has transcended itself onto various canvases, walls, and has allowed for a multidisciplinary approach to art making which pushes and often erases the definitions of various mediums. 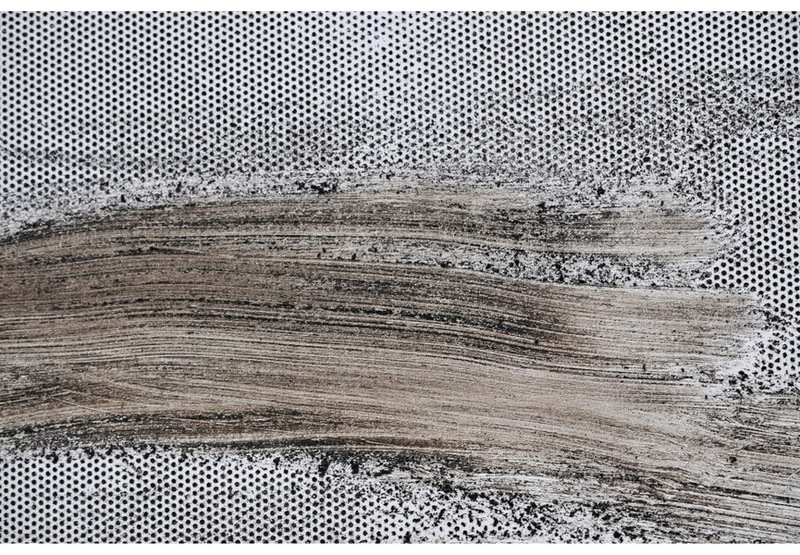 Concerned with the exploration of different materials, from spaghetti and dirt to bleach and anesthetics, various unconventional techniques have been employed in the path of their aesthetic advancement. Among numerous names, there is a respectable growth of young painters that successfully apply such technical explorations to produce extraordinary art and discover new ways of thinking about the medium. 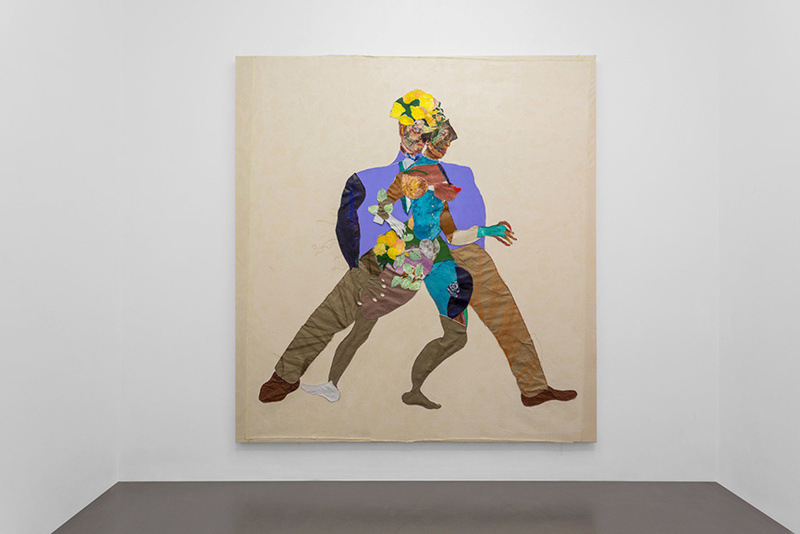 The following list of young painters from America features a couple of well-known names we believe deserve wider attention, as well as some of the biggest discoveries that have been presenting groundbreaking works during the last decade. 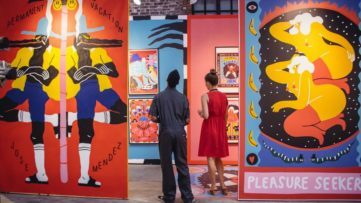 Looking at their extraordinary works of art that keep on pushing the boundaries of the medium in intriguing and unexpected ways, we are sure that contemporary painting in the US is in safe hands and is not afraid to allow the different approach of creativity and a different language of their stories. Covering the past and the painting production during the colonial period and the present, the 117 essays in this book, stand as a survey of art in America. In addition to the paintings from some of the most notable collections, such as the Rockefeller Collection, the book explores the production of some of the most celebrated modern and contemporary American painters. From lavish color illustration examples and interpretation of the subject matter and approach to painting of Georgia O’Keefee, Charles Demuth, Chiura Obata, Mark Rothko, Willem de Kooning, Richard Diebenkorn, Wayne Thiebaud, and Ed Ruscha, the book offers an insight into contemporary production as well by covering the display de Young in San Francisco. Whoever wants to get an insight into the much celebrated American painting production, needs to look no further. 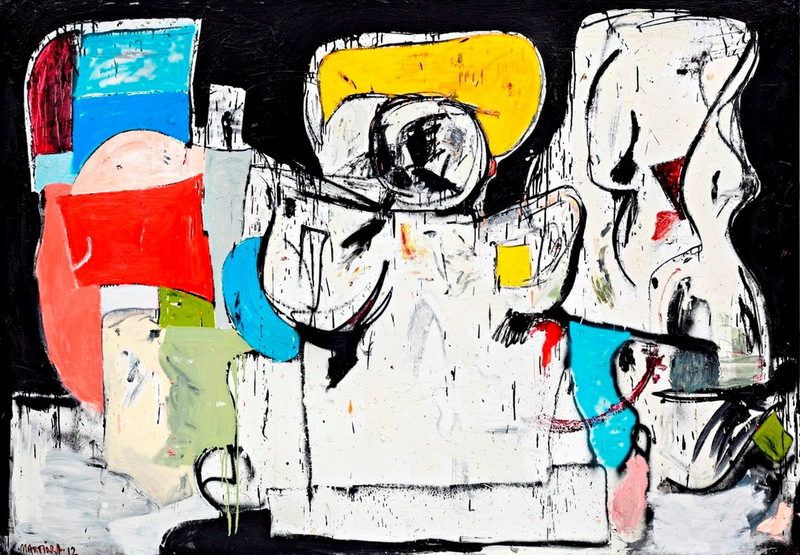 Eddie Martinez is a renowned painter and sculptor from Brooklyn, New York, widely known for his extraordinary mixed media paintings which often incorporate markers and spray paint, fused together with oil paint, all applied in aggressive manner and in contrasting combinations. 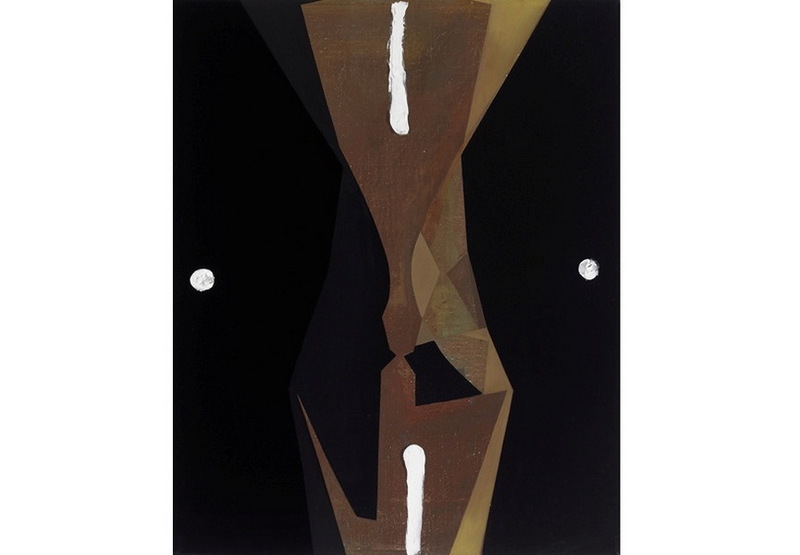 These surreal and powerful abstract paintings and found object sculptures, so remarkably strong and of certain muscular type, are the result of various influences that shaped Martinez’s unique style, most notably those of urban culture and modern masters. Showing his deep understanding of painting history, the images and motifs featured in his artworks include cartoon-like ducks, skulls, and clowns, filtered through coarse brushwork, extraordinary use of line and masterful manipulation of color. 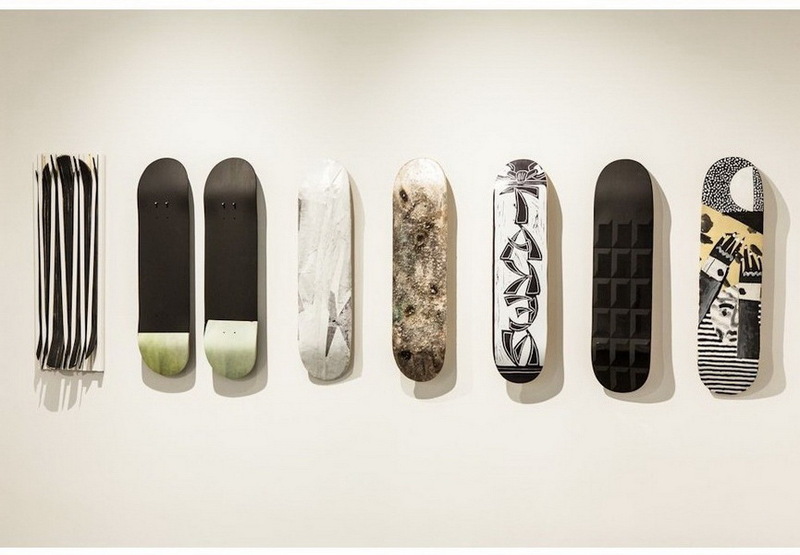 Last year works of Eddie Martinez were on display at Kohn Gallery, as a part of his solo exhibition titled Nomader. which received wide international acclaim and huge public interest. 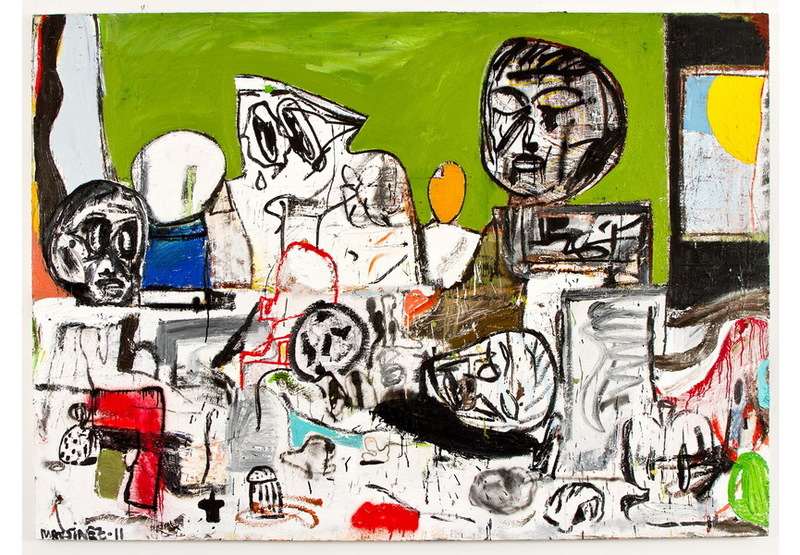 The extraordinary creative output of Josh Smith, renowned visual artist from New York, includes collage, sculpture, books, prints and ceramics, but what he is most famous for are his paintings that feature letters of his own name as their subject, and explore ideas of authorship and originality. Through this extraordinary approach, Smith addresses painting through various historical references and deprives his canvases of representational and abstract traditions to boldly question the function of the medium itself. In his magnetizing collages, Smith combines newspapers, drawings, photocopies and posters and creates instant abstractions made from recycled and trivial materials, which he then paints over with an impoverished aesthetic. Smith’s works can be found in numerous public collections including the Centre Pompidou, MUMOK, the Whitney Museum of American Art and MoMA. 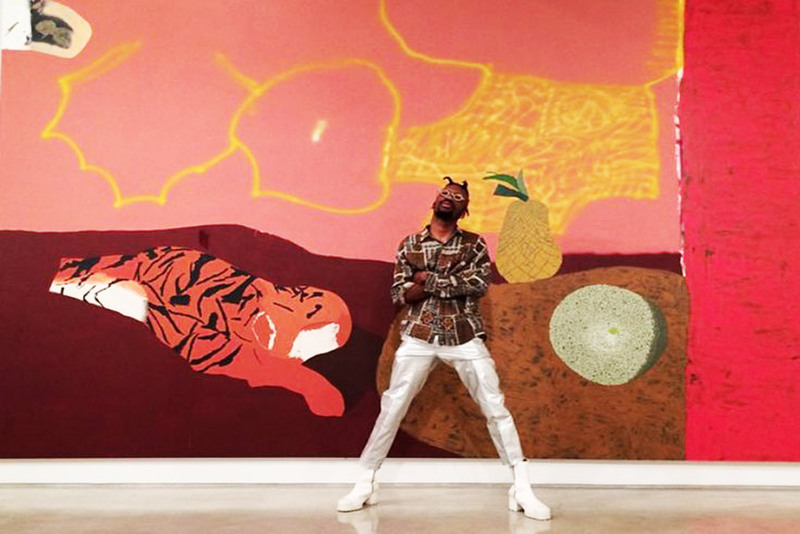 Some of his works are currently on display at MoMA, during its ongoing The Forever Now show. Julio Reyes is a contemporary figurative painter and former promising soccer player from Los Angeles. 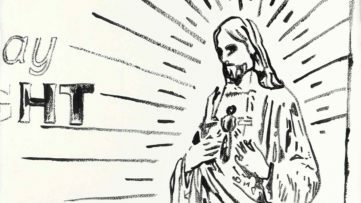 He is widely praised for his mesmerizing paintings that depict beauty surrounded by a weary world. As a child, Reyes was diagnosed with partial colorblindness, having difficulties distinguishing red and green, as well as blue and purple. But this highly talented artist managed to turn his handicap into an advantage, creating predominantly monochromatic artworks that have an exceptional appeal and power to them as the result of his subtle use of color. Reyes is a true master of painting who manages to achieve a delicate balance between visceral realism and ethereal concept in his works. Often beginning with a charcoal drawing, and gradually building up layers in oil or tempera, Reyes paints blocks of color that appear photorealistic when seen from a distance, but become more abstract and gestural upon closer inspection. 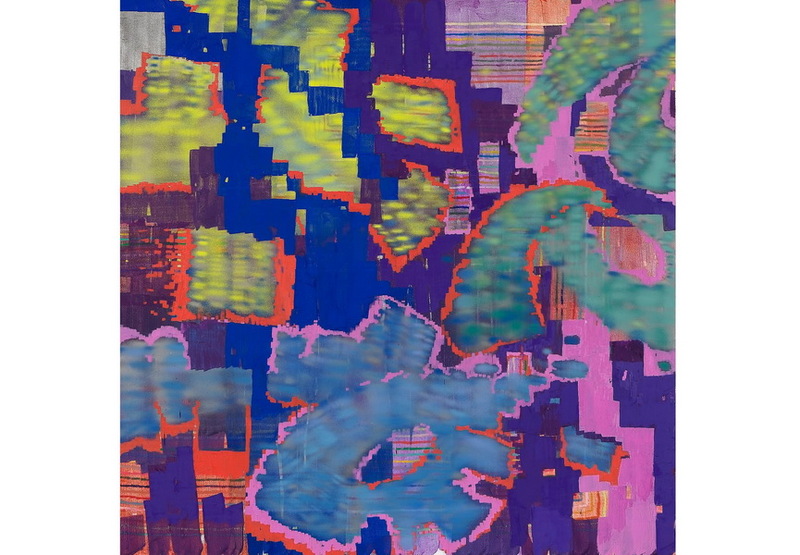 Keltie Ferris is an acclaimed American contemporary painter, educated at Yale’s art school and now living in Brooklyn. Ferris is best known for her large, multi-layered paintings that depict glimmering pictorial spaces, inspired by various subjects including digital image pixelation, New York City graffiti and city lights that are visible from her Brooklyn studio at night. The balance and symmetry in Keltie Ferris’s paintings invite their viewers to discover underlying grid formations, hidden beneath the layers of color and different styles of application, created by broad brushstrokes and smudged colors. Ferris finishes off her captivating artworks with arrays of dots and dashes of spraypaint and then returns with contrasting colors, adding short strokes performed in parallel arrangements around the previous layer. 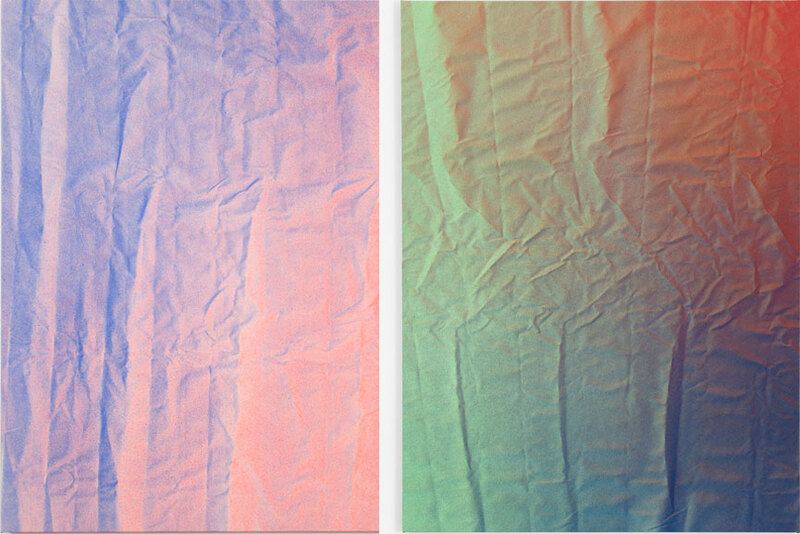 Here you can have a glimpse of Keltie Ferris’ extraordinary creative process. 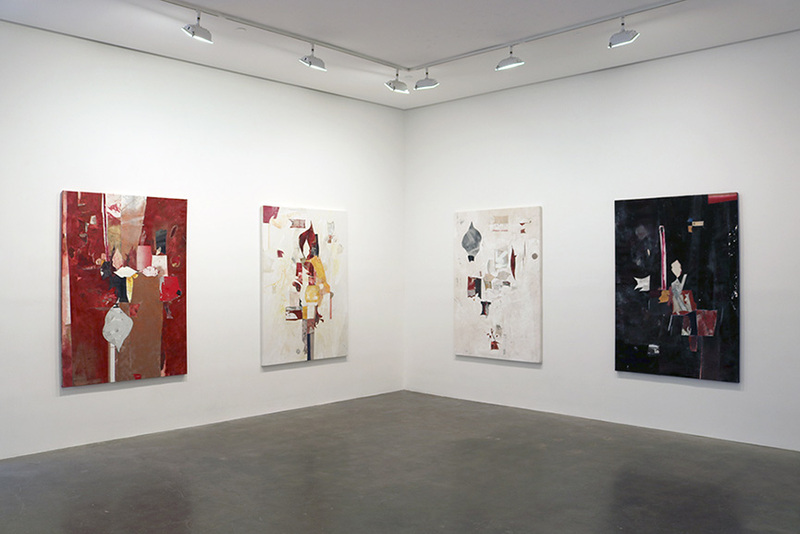 Los Angeles-based contemporary painter Nathan Hylden has been gaining rapid recognition ever since his first and critically acclaimed solo show eight years ago. Hylden is widely praised for his cutting-edge artworks that use rigorously conceptualized processes in order to investigate the philosophical relationships between emptiness and meaning. Despite their conceptual and technical tightness, Hylden’s paintings are neat and greatly pleasant to the eye. 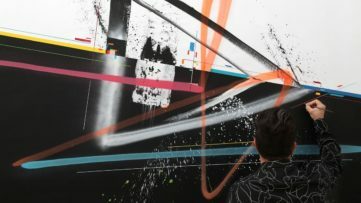 For hist most famous 2010 series of nine paintings, Hylden devised a strict technical process which consisted of painting canvases with holographic gold, stacking them in arrangements on the floor and spraypainting the overlapping sections in yellow, before finally stenciling black stripes onto each piece. The result were extraordinary artworks, intrinsically related by virtue of their genesis and aesthetic, yet each rather unique. Nathlie Provosty is an emerging and highly talented painter from Brooklyn, New York who has been growing widely popular in the last couple of years. 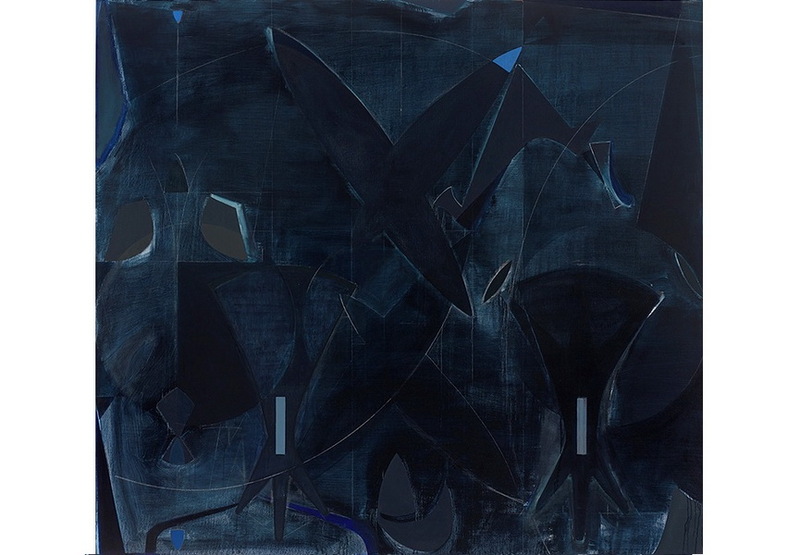 Within Provosty’s acclaimed and most famous Doubleu series, she paired matte and oil paint into closed forms, opening the space with their reflective surfaces and tenuously squeezed outer edges, implying multiple, open-ended associations. As viewers approach these mind-bending pieces of art from a distance, Provosty tricks them into discovering that pictorial space in the work is not as flat as it appeared from a distance, despite the apparent reductivism of her monochromatic palette. 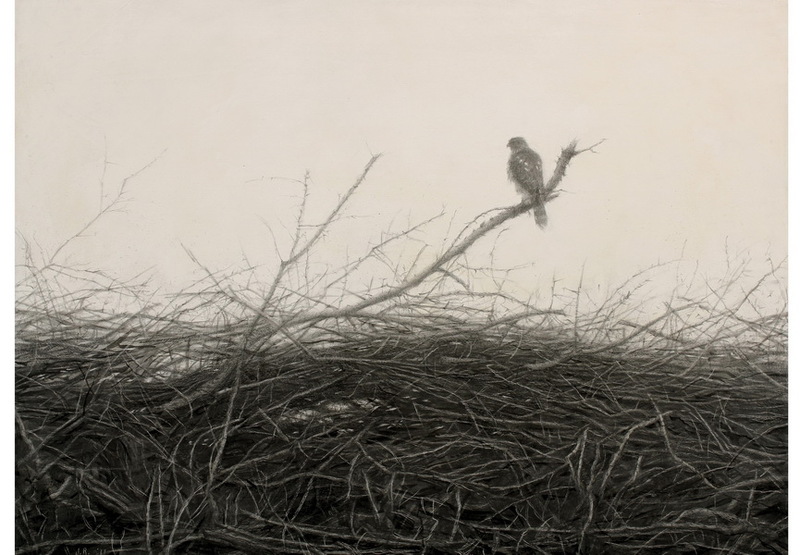 Nathlie Provosty is a recipient of several highly respectable awards, including the Rosenthal Family Foundation Award and American Academy of Arts and Letters Purchase Prize. In 2013 she provided an eye-catching artwork for Bryce Dessner’s solo album Aheym, creating the piece that significantly increased her visibility in the contemporary art world. Ryan Estep (1980) is an emerging contemporary artists from Brooklyn, a rising star who has been stirring up the art world in the recent years. Every day he is garnering more and more attention with his shadowy abstract paintings created in rather unique and unusual manner, using unconventional materials such as lipstick, drywall mud, dirt and even lidocaine. 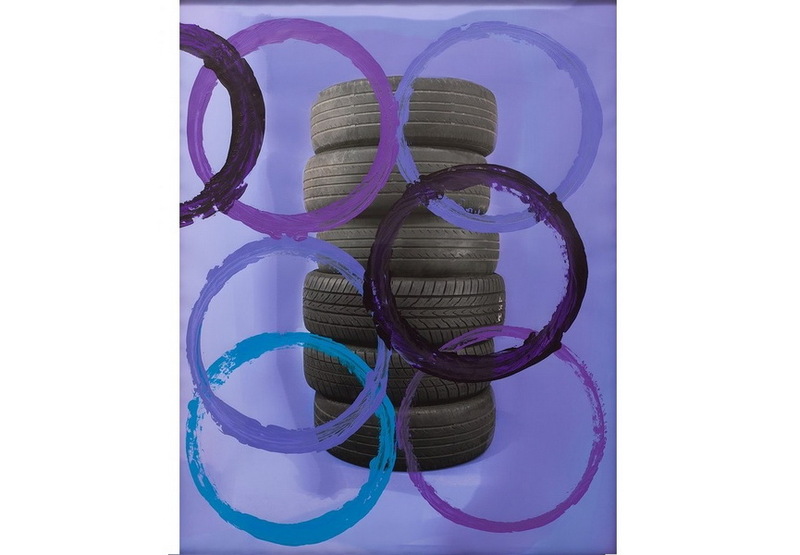 Eschewing traditional methods of painting, in one of his critically acclaimed series Estep used an industrial kiln to sterilize soil before he sifted it in careful patterns through a metal screen onto the glue coated canvases, smearing them when he removed the screen. 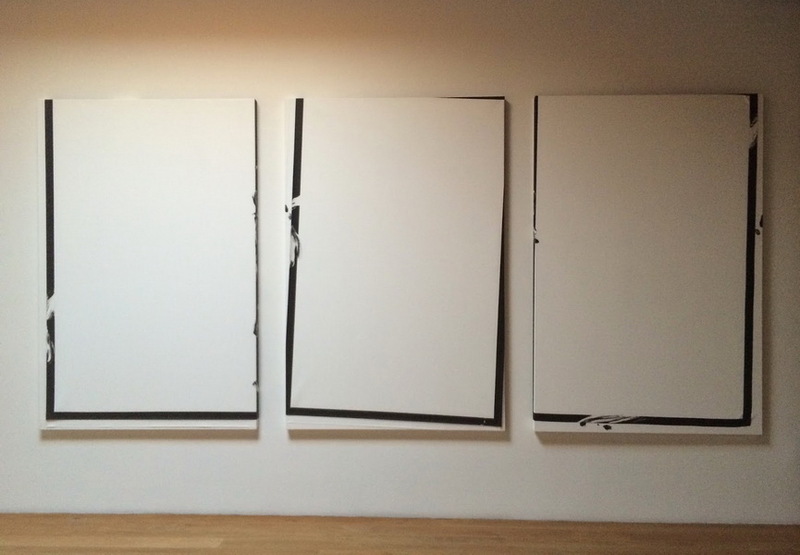 On the other hand, his large scale lidocaine paintings are sparse, monochromatic and industrial looking, with their edges painted with a mixture of black pigment and anesthetic that makes him to temporarily lose sensation in his hands as he attempts to re-stretch the wet canvas on its frame, establishing an extraordinary dialogue between material and body. 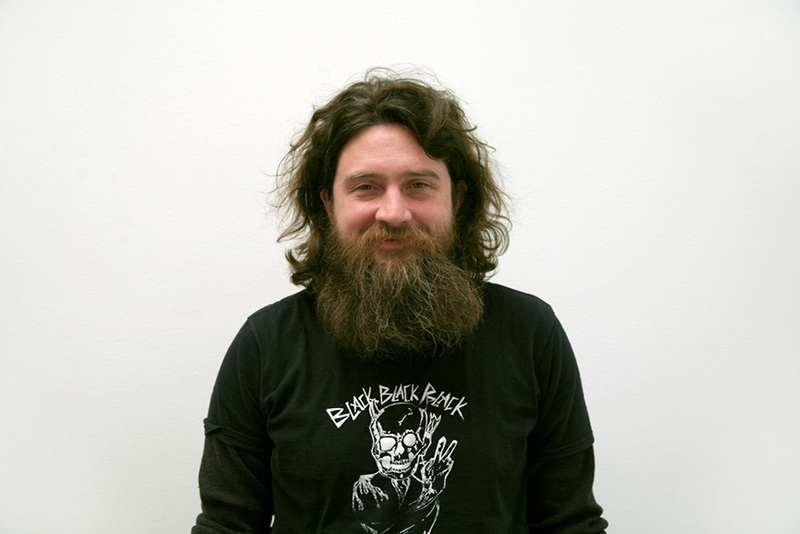 Ryan Wallace is a critically acclaimed painter, sculptor and installation artist from Brooklyn, New York, and one of the most respected American contemporary artists of younger generation. He is known internationally for his rather complex artworks, tactile abstract collages he creates using materials such as shredded tape, vinyl screens, wax, and other discarded and everyday objects. These extraordinary materials play the crucial role in Wallace’s works and are used with an intention to invoke the aesthetic qualities they are not usually associated with, cleverly deceiving viewers into seeing them as paintings, and not as mixed-media works of art. 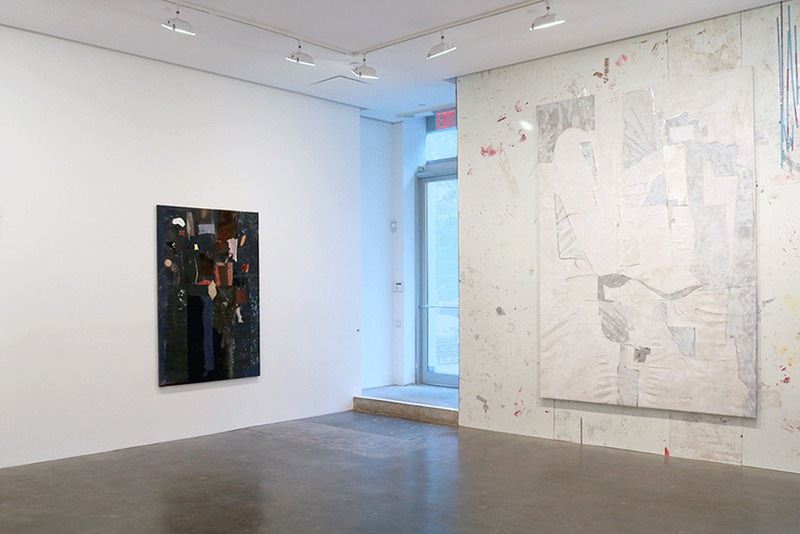 The graduate of the renowned Rhode Island School of Design and the recipient of the 2011 Pollock-Krasner Foundation Grant, Ryan Wallace has shown his exceptional paintings, works on paper, installations and sculptures in numerous venues around the world. Sam Falls is a multi-talented contemporary painter, photographer, writer and videographer of international renown, whose captivating works combine photography, painting, and sculpture, exploring the ways in which color, digitally manipulated photographs, and natural processes work together in a single piece of art, investigating artistic potential of each medium. 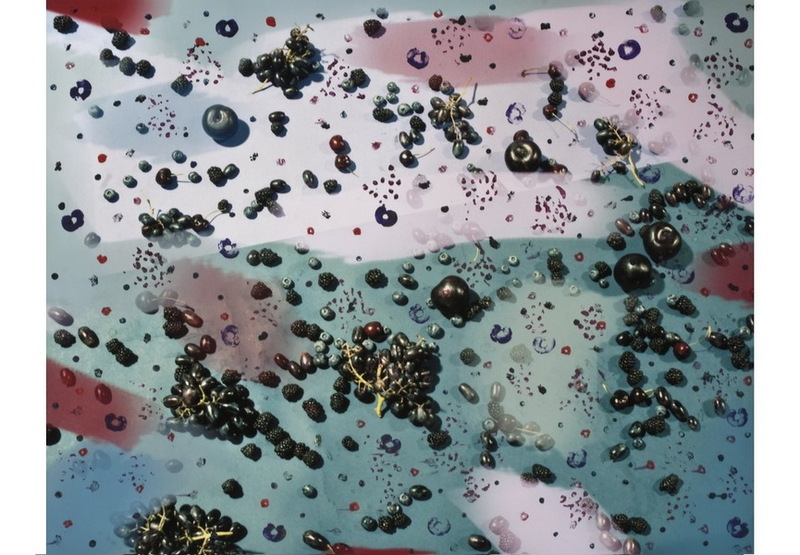 His painted photographic prints combine airbrushed acrylic paint and abstract photographs while cleverly incorporating external elements such as variations of light, space, and time, with the intention to raise questions about perception and how we relate to various media. Sam Falls’ works can be found in several permanent collections, including the International Center of Photography, Bidwell Projects, the Statoil Collection and MOCA Los Angeles. 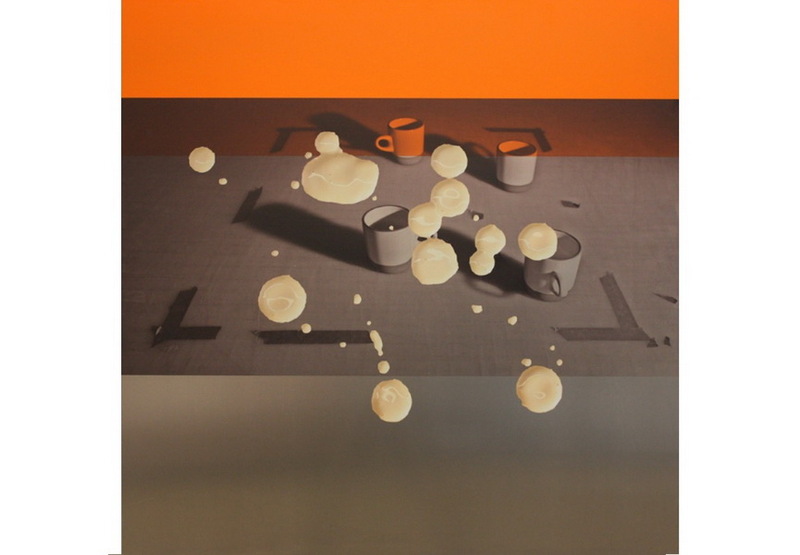 In addition to being picked by Artforum as the Best of 2011, Sam Falls was also chosen as one of Forbes’ Top 30 Under 30 and was featured by Modern Painter as one of the 100 Artists to Watch. The production of the Texas-born artist Justin Adian occupies an in-between space and helps to visually illustrate the theoretical thinking regarding the place of sculpture and painting. 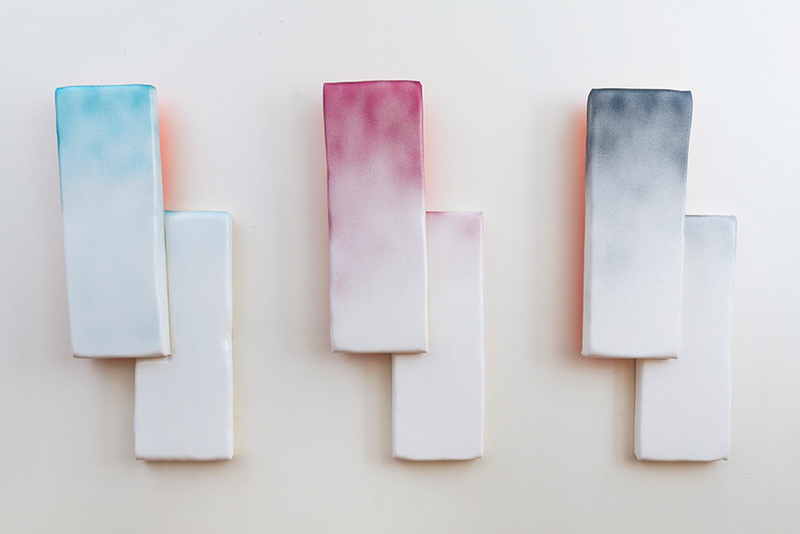 The artist breaks away such divisions and focuses on the creation of the minimal abstract objects – wall-mounted reliefs from foam shapes, which Adian beforehand covers with oil enamel or spray painted canvas. The adding of color to the shapes, in fact, separates the object from the wall and gives it a new identity of a free-standing sculpture. 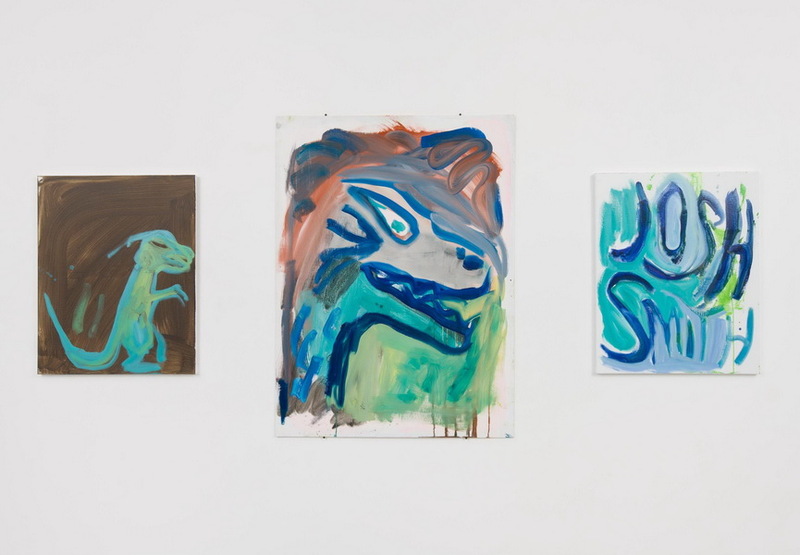 Playfulness and free-spirit decorate the creativity of the artist whose 2015 first solo exhibition in the UK was most talked about work during the Frieze Week. The work of Torey Thornton honors experimentation, use of different materials, and the tradition of painting and sculpture. His abstracted forms, and play with form, color, scale, and perspective, are all tools with which the artist investigates viewer’s perception. Thornton’s paintings allow for a very personal and individual reading and understanding from the audience, creating a sense of openness and ambiguity. Few were known to describe his work as shadows, ghost-like images through which a new world vibrates. A sense of familiarity and surrealism is all at once present in his work, which has, in most recent years received much praise from the art public. 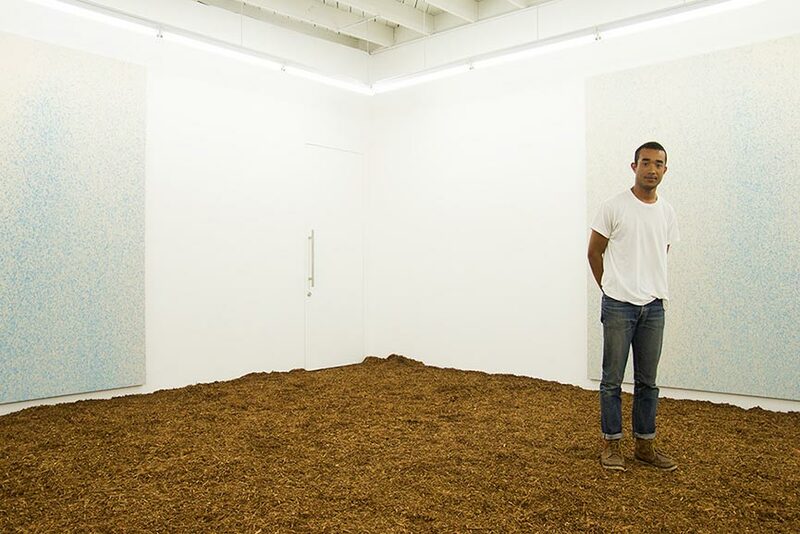 Featured twice, in 2013 and 2014 on the Forbes list of 30 under 30 in an ‘Art and Style’ category, Lucien Smith knows all about what it is to be popular and what the face of loneliness is truly like. 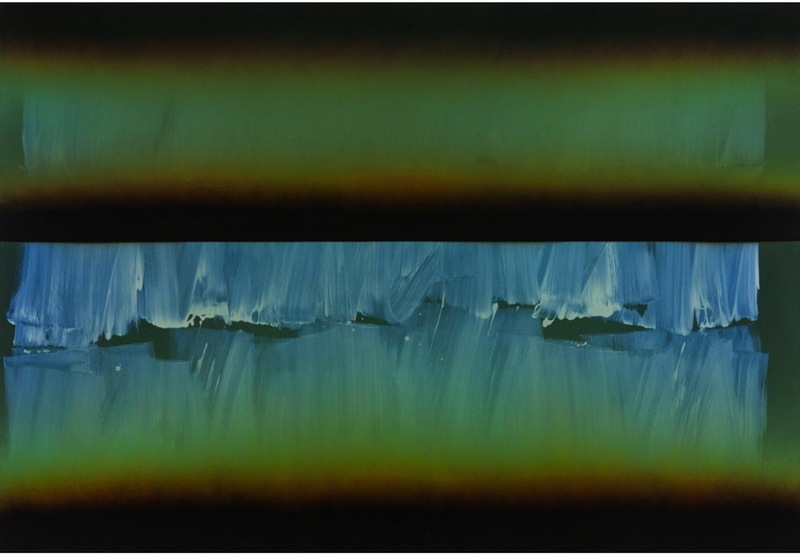 Through the influence of pop-culture, books, art history, but most importantly nature, Smith’s abstract paintings are often created by minimalistic tools, such as loose brushstrokes in his Rain Paintings, or form camouflage-style patterns, resembling Andy Warhol’s production, in his Tigres series. 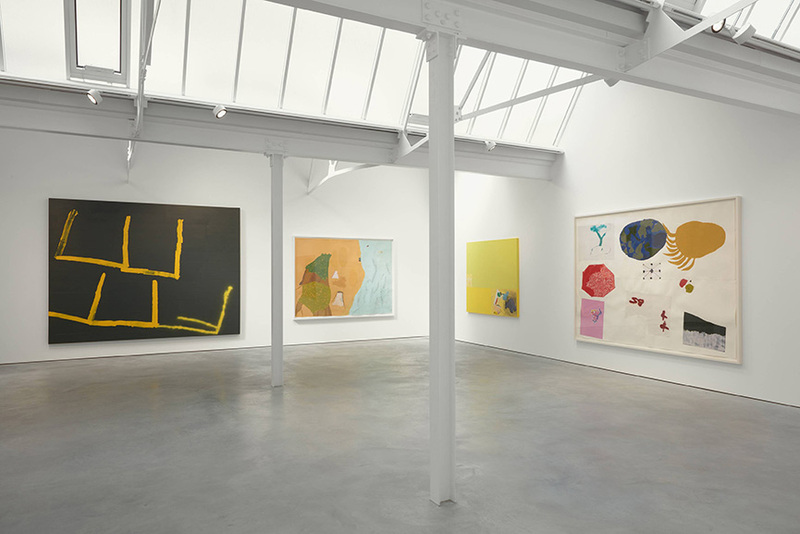 Often seen as one of the representatives of Zombie Formalism, Smith helps to create a new understanding of painting, and with it explores the revival of abstract art. The stereotypes surrounding the Black Female body, the Harlem-born artist Tschabalala Self, both accepts and rejects with the need to create an alternative, often fictional body that will attack the predisposed ideas. 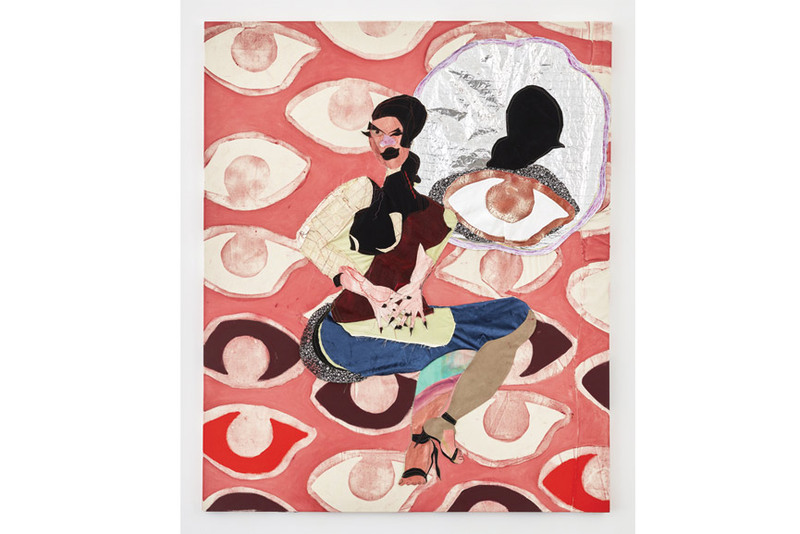 Her constructed bodies examine the intersectionality of race, gender, and sexuality with the help of the traditional painting and printmaking disciplines, along with the combination of color, fabric and dry leaf visible in her Tropicana painting series. Self’s both strong and feminine images have made her one of the most important emerging American artists today. Collapsing the two dimensional and three dimensional space, Tauba Auerbach’s Fold series received much acknowledgment. This young and experimental artist, works across many disciplines, including painting, artist’s books, photography, and sculpture. Her early work was influenced by the investigation into the limits of the language. 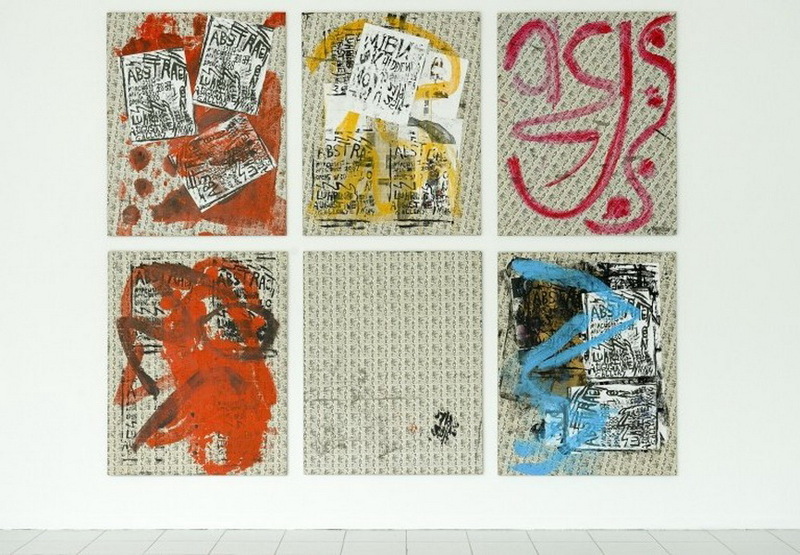 Incorporating typography, text and design, her work explored various linguistic systems. 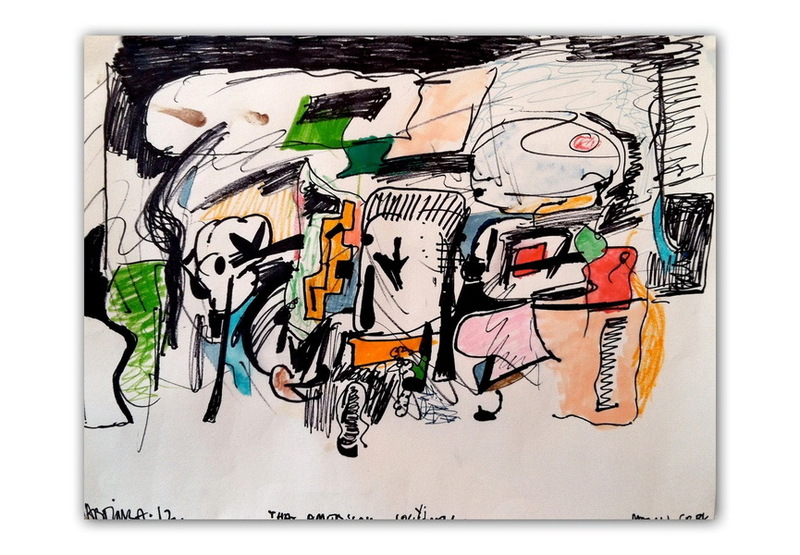 Recently her paintings focus on abstract patterns, order and randomness. 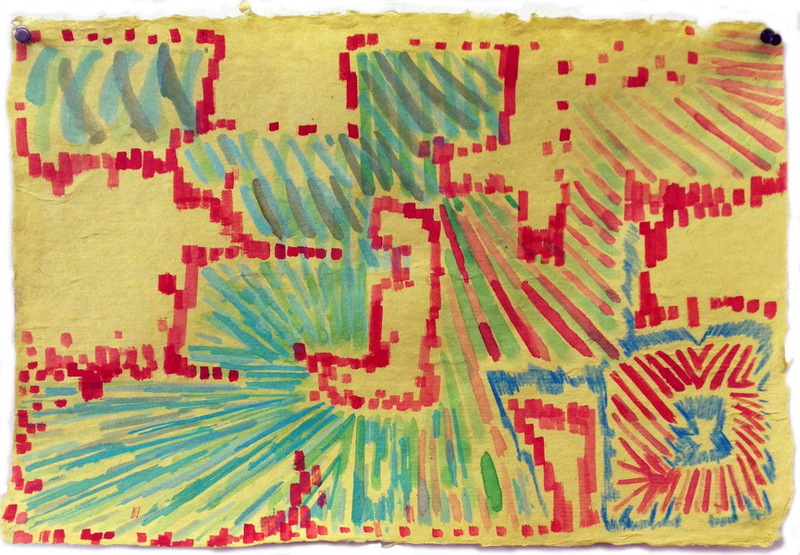 Taking inspiration from mathematics and physics Auerbach explores the limits of our structures and logic. 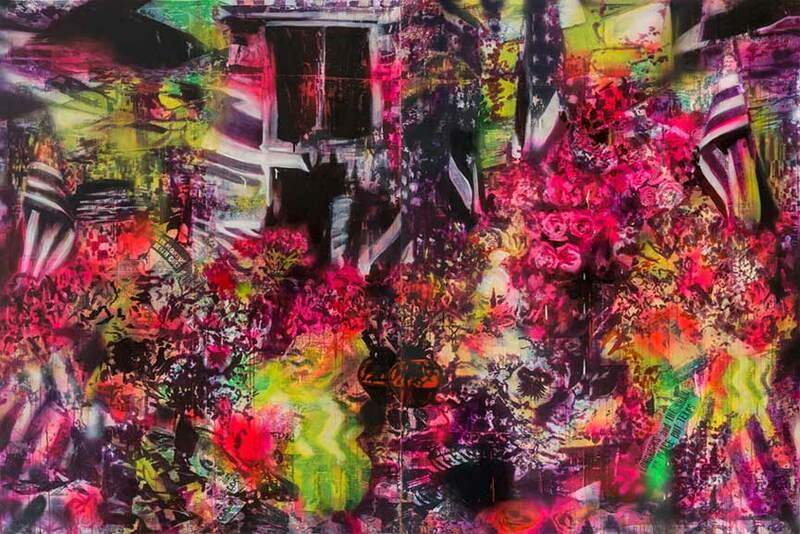 Rosson Crow is famous for her large scale vibrant paintings. Blending historical allusion and theatrical illusion, her paintings present nostalgia-laden interiors. Taking inspiration from a variety of sources, including Baroque and Rococo interior design, cowboy culture, Las Vegas architecture, theatre and music, Crow has created her own and unique style. Big, bold, and fun are the usual three words used to describe her work. Last year, for the occasion of her exhibition at Honor Fraser, Crow added filmmaking to the mix and has produced her first feature film Madame Psychosis. 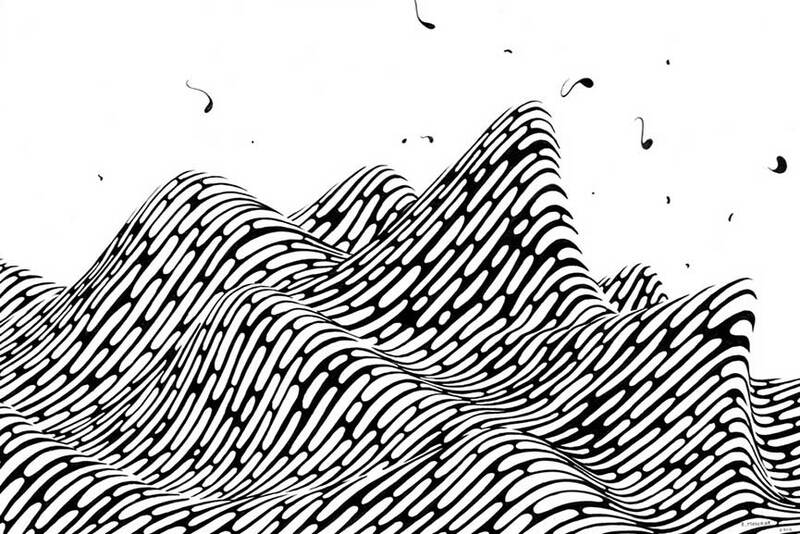 Constantly challenging himself, the Oakland-based artist Brendan Monroe explores the world. His interpretations of the world are mostly rooted in science and then transformed onto the canvas or as a sculpture. From time to time, the artist accepts few illustrations commissions, and his work is also known to decorate few facades of various buildings. The power of his work is reflected through the tension between reality and surreality that give his images strength and allure.